1. HUNTS, a timber-framed house, the front clad with weather tiling. The local shoemaker lives here and the verandah is the remains of a butcher's shop earlier this century. The parlour wing on the right, with its fine outside chimney, was probably added about 1600 during prosperous times. There are good attics with a large dormer window. 2. ELM COTTAGE, 17th century, lies just beyond the Post Office. Although it stands well back from the present road, an old photograph shows that the common land once reached nearly to the front door. Notice the chimney stack which stands well away from the walls. 3. THE RISING SUN was built on land which was common land until the enclosures of 1846. Turn left beyond the Rising Sun. 4. THE CAGE, the small building on your right, was an overnight prison and the only building which stood on the common. There are constables bills showing its use in the 1790's. It is built of Charlwood stone with galleting (small pieces of darl stone inserted in the mortar) and has recently been restored and the doorway raised. It is now used as in office by the Clerk of the parish council. 5. SUN COTTAGES is the name given to the small close of houses further down on your left. They are all old houses, MEADOWS EDGE and SUN COTTAGE on the right are 17th century and timber framed. FARTHINGS, the white brick house on the left was until recently a pair of small cottages, each with one room up and one down and a lean-to kitchen which contained the stairs. Turn round and take the lane to your left, called either Rosemary or Cony lane. 6. TUDOR COTTAGE on your left originally had one floor only. Prom, the side you can see the large timbers and the thick upper end of the main posts, often found in 16th century houses. It was thatched until the 1930's. 7. OLD ROSEMARY COTTAGE, also on your left, is a late 16th century house with its timber framing still visable and unchanged. In complete harmony with its surroundings, Rosemary Cottage seems almost to have grown out of the ground on which it stands. Carry on down the lane. 8. THE VILLAGE SCHOOL, built just before World War 1, lies in front of you at the end. Nowadays the children transfer to Horley at eight years old. Turn left to see two medieval open hall houses. 9. MORES, on the left, with its Horsham stone roof, was extended to make a smoke bay and later a chimney was added beyond that. 10. SWAN COTTAGE, on the right, had an outside chimney added when the open hall was floored over. Notice the steep roof which suggests it was once thatched. Return past the school and turn left down an unmade road. 11. CHAPEL FARM is a timber-framed house built with an outshot atthe back containing the stairs. The wing on the left is recent, within living memory cattle were kept in the low barn attached on the right. 12. PROVIDENCE CHAPEL lies beyond. This curious ranch-like boarded building, which is still used for services and Sunday school, is said to have been erected here in 1816. There is a wide verandah paved with Charlwood stone. The little burial ground has a number of tomb stones, including one to Thomas Round, whose charity to the poor of the parish provided bread each New Year's Day. 13. PROVIDENCE COTTAGES. Turn directly back to Chapel road, passing the row of four 19th century cottages, built of bricks using a decorative pattern of red and brown with some black headers. The red bricks were made in a kiln and the brown bricks were made by mixing coal dust into the clay before burning outside in a clamp. 14. HARROW HOUSE, with its fine timber-framing and a Horsham stone roof, is opposite. It was the Plough and Harrow Inn until the 1820's at which time the land across the road, now the Perrylands Housing Estate, was common land. Take the narrow path further along on your left between two hedges, which leads to the main road through the village. 15. The OLD MILL faces you across the road, standing well back. The top of this tall smock mill was burned down in 1901 and the base has been converted to a cottage. Turn right here to get back to the Hall. If you are still feeling strong continue on to Walk Two. Start your walk at the end of Walk One, i.e. where the lane from the Old Mill joins the road. Facing the Mill, turn left and walk on past the shops. At one time this area was common land. 16. CHARLWOOD PLACE FARM can be seen ahead on the right. This farmhouse is a central Chimney house built in 1590 with early additions at the back and on the left and a new roof overall. Traditional central chimney houses were built with a fairly large room on each side of the chimney bay, up and down, with the four flues running into one stack. The front door of Charlwood Place Farm faced the Common. The granary, barns and farm pond can still be seen. 17. BOYS' SCHOOL. The white houses on the other-side of the road was the Boys' School at the turn of the century. Return in the direction you came until you reach the Recreation Ground, which was formed when the commons were enclosed in 1846.
century house with a modern wing. On reaching the exit from the. 'Rec' cross the road (Ifield Road) and turn left. 19. THE DOLBY GREEN complex is on your right. It is formed (from left to right) by a barn adjoining an open hall house which was jettied in the front, a later timber-framed house and lastly a modern house built recently to replace a Victorian house on the same site. The Barn was once headquaters of the Volunteer Fire Brigade but now forms part of the living accomodation. Continue on down Ifield road, noticing the UNITED REFORM CHURCH and the row of little brick cottages called DOLBY TERRACE, with the date stone of 1852. 20. WEAVERS stands back from the road just after Chalmers Close. The brick cladding hides a small timber-framed open hall cottage. There is evidence of a long window such as is usually found in a weavers house. 21. LITTLE DOLBY, further along near the brook, is also a fine open hall house, with a crown post roof. James Dolby who was fellmonger (a dealer in skins or hides) lived here in 1851. 22. THE OLD BAKEHOUSE. Another open hall house with a fine crown post roof and smoke blackened rafters, this was a bakehouse in the early part of this century and like many of these old houses was originally one house, in the last century became three cottages, and is now one house again. Turn left between the white posts immediatley beyond Dolby Green on to the foot path known as Blackditch. This is paved with Charlwood stone (see notes). These old stones will lead you to the Half Moon (and the Church). Look at the interesting group of buildings here, for this area was once the centre of village life. 24. THE COTTAGES, THE STREET, opposite the Half Moon, are both 15th century. The one nearest the Church has smoke blackened rafters and crown posts and was jettied facing the Church. The adjoining cottage, which was probably built a generation or two later, also has crown posts and had a jetty facing the Half Moon. Evidence of the jetty can be seen in the timber framing when viewed from the side. 25. TEMPLE BAR HOUSE, on your right, with its steep roof and brick front hides another medieval hall house with smoke blackened rafters. Notice the unusual sliding windows upstairs. Continue up to the main road and turn left for the Parish Hall. BRASS IN ST. NICHOLAS CHURCH 1553. Starting from the Parish Hall, cross the road, go left, then right and walk via the stone paths to the Church. Such paths once formed Charlwood's ways and lanes as this is local stone quarried on Norwood Hill and Stan Hill. There was once a row of almshouses on that part of the Churchyard nearest to the road. The Parish Church, dedicated to St. Nicholas, is built largely of Charlwood stone. If you have not already visited the Church, do make time to do so, for the people of Charlwood have worshipped in this lovely building for 900 years. Look especially for the fine Norman arch, the wall paintings of c.1300 and the beautiful medieval screen built by the Sanders family of Charlwood Palce. To continue your walk, follow the path beyond the Church. 26. The GLEBE HOVEL (open cattle shelter) in the field on your left is probably 200 years old. It is slightly curved, an unusual feature. This was once glebe land which was farmed by the Rector as part of his living. This was bequeathed to the Religious Society of Friends in 1683 and remained in their possession for many years. Over 100 Quakers, many of them from Ifield,were buried in the fields beyond. 28. PRIMROSE COTTAGE stands back off the road on your right (it is only visible from the road in winter). It is small unspoiled house with exposed timber framing and a Horsham stone roof. 29. ROBINS FARM, just beyond the brook, is larger, although the wing on the right is relatively modern. It too has exposed timber framing and a Horsham stone roof. The larger diagonal braces are typical of the 15th and 16th Centuries. Turn back and go left up Glovers Road. 30. IVY and CHERRY COTTAGES on your right were built soon after 1846 on land recently enclosed from the common. They were farm workers cottages. The brick bond is known as Poor Mans Brick as by putting bricks on their side the maximum area of wall could be built with the minimum number of bricks. between open hall and chimney. 32. BROOK COTTAGE, as you would expect, is by the brook, on the right near the end of the road. The end is a small open hall house and on the left are 17th century timber framed additions. 33. GLOVER'S HOUSE stands at the end of the road. Hidden behind the fine Victorian facade is a timber-framed 17th century dwelling. 34. PAGE WOOD HOUSE lies well back. The timbers are covered but it is a large open hall house with crown posts. 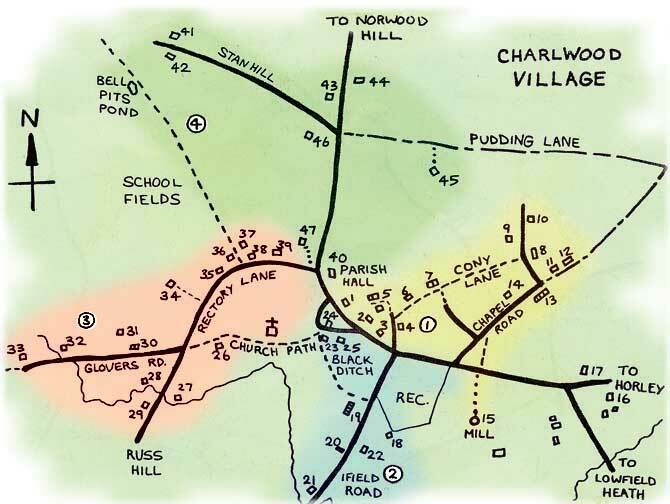 Elderly Charlwood people can remember it as three cottages. 35. PAGE WOOD COTTAGE, with its unspoiled colourful front, was built with a smoke bay. This was replaced with a large chimney at the back of the house, which rises through the outshot roof. 36. SPRING COTTAGE belongs to the 18th century. The ground floor is brick built with a tile hung timber-framing above. The internal walls are timber-framed and there is an inglenook, fireplace. The stairs are contained in an outshot. 37. BRISTOW'S or SCHOOL COTTAGE stands back from the road. This charming low cottage was built about 1620 as a charity school for boys by the Rev. Bristow. Although there is no known documentary evidence, it is understood that it remained a school until about 1870. 38. The west end of BARBERS COTTAGES consists of an 18th century cottage behind the 20th century front. 39. LAUREL COTTAGE is a small open hall house. The chimney was added at a later date, with the stack well away from the house. Note the large braces which are a feature or early houses. The Parish Hall is few steps ahead. 40. The PARISH HALL was built in 1852 as a Girls and Infants School. It was built in Charlwood stone, laid in courses. The school was converted into a meeting hall after the new school was built in 1913. Cross the road into Rectory Lane and pass the old houses numbered 39, 38 and 37 in Walk Two. Take the public footpath up beside Bristowís Cottage. These fileds are still known as the School Fields. You will find that the land rises. Walk straight ahead keeping the hedge on your right. At the top of the second field is BELL PITS POND. Legend says that the Church was to have been built here but each time the bells were raised, they were mysteriously pulled down by the Devil. In fact these ponds were quarries for the local stone. At the top of the fields turn right on to the road and right down hill. This is Stan Hill. 41. The Hotel on the left was built in 1873 as Charlwood and District Cottage Hospital. Once it had a verandah all along the front. The building ceased to be used for care of the sick in 1903 when the hospital transferred to Horley and reopened as the Horley and District Cottage Hospital, which is still in use today. 42. STANHILL HOUSE is on your right. There is no front door on the road side because the old road was on the other side of the house. The present road was built sometime between 1841 and 1870. The lower part of the house is built with Charlwood stone. Notice the large external chimney with stone at the base and the stack built away from the house. 43. DORMER COTTAGE on the left needs to be seen from the Norwood Hill Road as this is the part that is old; a medieval house with crown post roof. 44. THE COTTAGE, Norwood Hill Road, is the name of the house opposite and this again is an open hall house. 45. SPOTTLES down the aptly named Pudding Lane, opposite the bottom of Stan Hill, is yet another open hall house perhaps one of the oldest. The wing on the right is modern. In front and to the right was once Spottles Common. 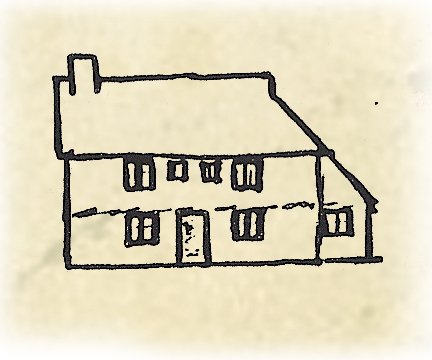 At one time Pudding Lane led to COLLE, the largest house in Charlwood at the time of the Hearth Tax in 1662. Sadly, Colle has long since vanished. 46. STAGGERS AVON, back on the Stan Hill side of the road, is on your right as you look towards the centre of the village. It too, stood on the edge of Spottles Common. It is a symmetrical Georgian house with a high Victorian wing. 47. THE MANOR HOUSE or TAYLORS FARM is a 15th century open hall house, with fine wings added at each end and a timber-framed porch. You are now back at the Parish Hall. We hope you have enjoyed these rambles around our village. All footpaths are given numbers by the County Council, and although numbers are very unpicturesque, they are a very useful way of referring to a path, so we make no apology for using numbers. For some people the map itself will be sufficient for them to follow the rights of way, for the map marks the necessary hedgerows. But it was felt that some people might like additional notes. The many different paths give rise to a large choice of circular walks. 314 Runs straight on from Glovers Road to the edge of wood and continues straight on through the wood to meet the Rusper - Parkgate road. It is a wide path all the way. (On reaching the stream it can be very pleasent to follow it along to the right, but this is not a public right of way). 311 (a bridal path) enters the western edge of the wood by the parish boundary well beyond the Russ Hill Hotel. It goes in a northerly direction parrallel to the end of the wood crossing path 314. Before joinging the Rusper-Parkgate road it enters one field. 308B commences opposite Rise Hill Hotel. After one field it enters on the wood and is waymarked by yellow dots on the trees. Follow these carefully as it is not a wide path. It ends by the junction of paths 314 and 311. GREENINGS PATHS (use the map with these notes or O.S Map TQ 24 which is 2.5" to 1 mile). 334 Beggars House Lane. (This bridle way is described on a map over 400 years old as "The way that comyth from Charlwood to Newdegate"). At the top of Stan Hill it begins as aí narrow but tarred road, at Eastlands the lane continues straight on, but is often very muddy. It continues on to the Rusper-Parkgate road. N.B; Greenings Drive, which leaves Beggars House Lane at Eastlands and runs parallel to it, is not a public right of way. 331 This path leaves Glovers Road by the side of Brook Cottages. Turn left over the stile, keep the hedge on your left until the next stile is reached. The second field is crossed in a semi-diagonal direction (N.W. 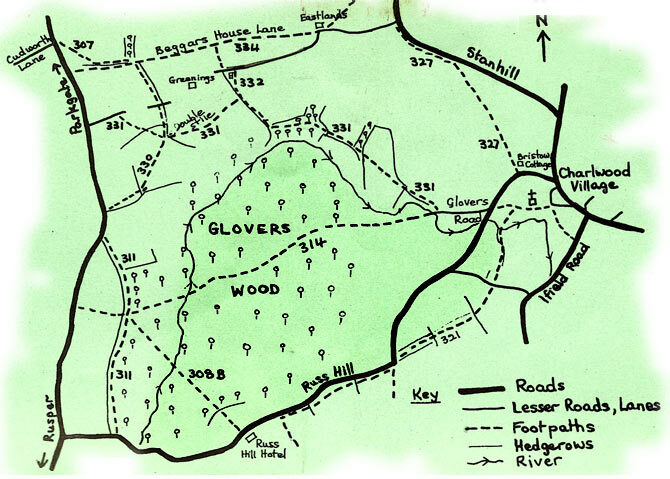 see map) to a stile (rather difficult to find if you have not been that way before), with a path through a narrow copse. On leaving the copse again keep the field hedge on you left until reaching a stile leading into the wood. Follow the path straight through the wood and you will reach a stile into a field. Keep the field hedge on your left again, but before reaching Greenings Cottages there is a junction of paths. Our path ( 331) turns westerly across a large filed divided by wire to a double stile with bridge at the other side of the field. On entering this next field it crosses the route of path 330. 331 turns north-westerly, cutting across the corner of the field to a stile and in the next field crosses still approximately N.W to a lane at Rolls Farm. Turn left here for the Rusper-Parkgate road. 332 This is a useful link between path 331 and Beggars House Lane. If we imagine we are back on 331 we have come through the wood and up a hilly field. As the Greenings Cottages loom in sight path 331 turns left, but path 332 continues straight on. On reaching Greenings Drive, turn left. A short distance ahead is a stile on your right. Go over the stile and straight ahead over the field to another stile, which brings you to Beggars House Lane. where path 307 also joins Beggars House Lane. 327 This path is known as School Fields because it starts at Bristowís Cottage, which was the first school in the village (c.1620). With the cottage on your right, proceed straight ahead through the fields, Keeping the hedge on your right until you reach the top of Stan Hill, near Barfield Farm. The path then goes into the narrow copse parallel to the road until Greenings Corner is reached. 321 If you are going on this path for the first time its easiest to start at the Russ Hill end. From Russ Hill Hotel the path runs inside the field parallel to the road until the sharp corner on Russ Hill. It then crosses into a tracks which leads to a field. Keep the hedge on your left until the next stile then cross diagonally downhill to a stile, where you cross Ringers Lane, and proceed over several stiles into Church Walk. In medieval times houses were not built with chimneys. The fire was on the floor in the big central room or hall. There was no first floor above the hall and the smoke went out through the roof. This is the transition stage between Open Hall and Chimney. A large part of the hall was floored over leaving a smaller area (about 6ft. deep) for the smoke to rise. Chimneys were not built into houses until after 1550 or thereabouts. 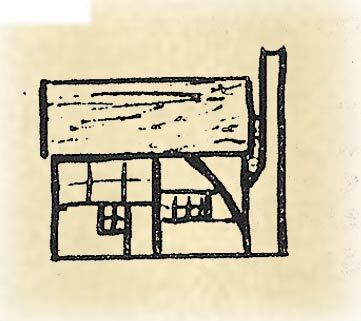 The ground plan of timber-framed buildings was always rectangular and just one room deep |12-20ft/). This could most easily be enlarged by adding a single storey outshot at the back with a lean-to roof. This term refers to the type of roof construction. The crown post is a central vertical support, which itself is supported by diagonal braces (Which give stability to a building). A crown post roof suggests a date of 1550 or earlier. Charlwood Church has eight crown posts. Charlwood stone forms the high ridge of Norwood Hill and Stan Hill. Millions of years ago this area was part of a hugh lake extending over several counties. As the water receeded, the area around Charlwood became marshland and the habitat of tiny freshwater snails, whose fossilized shells make up the stone we see around us today. A very hard stone, this is suitable for paths but is difficult to shape for bulding purposes. Timber. Here in the Weald, between the North and South Downs, there were many trees, including oak. Our ancestors used the most suitable materials around them, so in this part of the country they used wood and left us a heritage in fine timber-framed buildings. Common Land. Much of the centre of the village was common land until after the Enclosure Act of 1846. In medieval times, in return for certain services, the tenants of the Lord of the Manor were allowed to graze sheep and cattle on the commons during the summer months, in order to fatten them up for slaughter in November, for meat often had to be salted down for the winter. This practice continued for centuries. No house could be built on the commons, but most houses were on land surrounding them. When the commons were enclosed, a parcel of land was allotted to each tenant and new houses were often built in front of the old ones. Many of the beautiful scotch pine trees around the village date from this time and appear to mark the new boundaries. Roads which once crossed common land are usually straight. Committee and Historians: Richard Barker, Pat Billingshurst, Tony Brookes, Vida Campen, Morna Case, Colin Gates, Julie Lowe, Jean Shelley, Barry Smith, Joan Wright, and many other contributors to numerous to mention. Printed in the year of Charlwoodís 900th Aniversary 1980. Re Printed with additions 1983.